I can’t quite believe how quickly the date for the Moonwalk in London has come around. Two weeks on Saturday just gone, I’ll be walking across London for 26 miles with 17,000 or so other people. It seems ages ago when I started training for this event, but in some ways I don’t feel as though I have given up every Sunday morning to train either. This weekend we had diaried our 20 mile walk. This was our longest Moon walk training session and also our last long training walk before the event. If we can walk 20 miles then we reasoned we can walk 26. Deciding on Saturday afternoon instead of Sunday morning, we planned to set off just after lunch with the aim to complete the 20 miles in six hours. This would put us on track to finish the marathon in eight hours on the night. On previous training walks I have just taken a bottle of water and put a snack in my coat pocket, but for this walk I decided to take what I was going to need on the night as this would determine what I may need that I forgot etc. Packing cereal bars, nuts and sweets for my snacks in my bum bag (I don’t want to carry a ruck sack on the night), I also packed bits and pieces like plasters, lip balm, hair tie and my phone. This I realised wasn’t an extensive list of what I may need but it was a good practice run. I also didn’t want to wear my coat despite it being a bit chilly, as I wouldn’t be wearing one on the night so I didn’t want to rely on the extra pocket space during training. 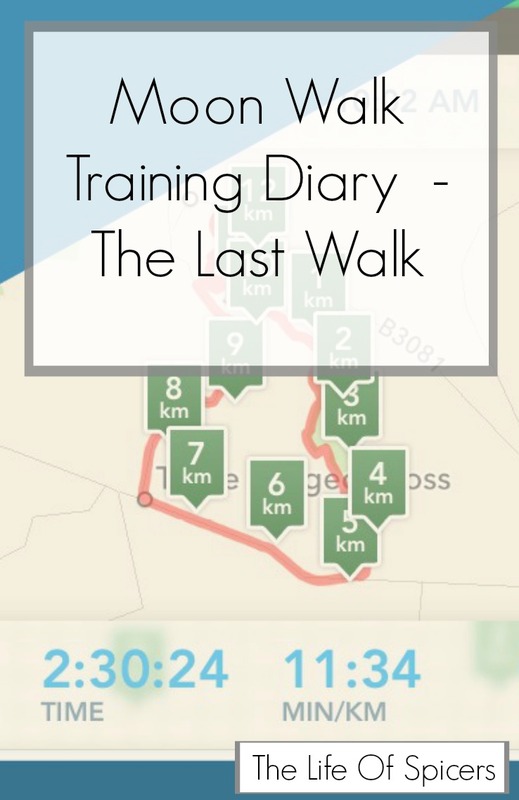 Our Moonwalk training plan saw us set off through Moors Valley Country Park, and out onto the Castleman Trailway which is a local path that used to be the railway line. We knew we could follow it for ten miles to be able to turn around and come home again. The weather was very kind to us, despite being a little chilly, we only had one shower that lasted for around five minutes. Our Moon Walk caps are waterproof which helped keep our heads dry a lot. I have learned that my nemesis is 12 miles. It’s at this point that my legs get heavy and I start to kick the stones underfoot if we’re off road. By mile 13, I have usually passed this hurdle and despite aching feet I am able to carry on quite easily. My amazing socks really do help with aching feet. We veered off the railway slightly and followed a cycle path because there were horses around, and found ourselves walking down tracks and past a farm, getting us slightly lost. Still if you follow a path, then you can turn around and follow it back home so we weren’t completely lost. I did find sweets really helped me get past the feeling of needing something but at the same time not quite being hungry. I also learned that I will need a lot more water than I took with me during the walk, but it will be more accessible to be on the night so I’m not worried about it. By mile 17, my hips and legs were hurting as well as my feet, although I was pleased to find that my feet hurt no more than they did around mile 11 so fingers crossed they would be the worst they were going to get and I would be able to carry on putting one foot in front of the other easily enough. Miles 18 – 20 were difficult I’m not going to lie, but it felt so good to achieve it when we did. I think on the night the atmosphere and adrenaline will help us get through the additional 6 miles we need. The biggest things I learned were that I go from not being hungry to being starving quite quickly, and then I NEED food then and there to avoid feeling rubbish. I am going to pack extra cereal bar snacks for the night to help me get through until breakfast. I have also learned that my feet seemed to recover quite quickly at the end of the walk, but wow did my legs ache a LOT the next day. I have booked the Monday off work to recover so it should all work out OK. I find walking boots are more comfortable than trainers, and these walking boots did well for me. In a bizarre way I really enjoyed walking 20 miles and can’t wait for the night now. Read about my Moon Walk experience.